Is Your Network Slow or Unreliable? Are You Searching for a new Managed IT Service Provider? Have You Recently Lost Your IT Guy? Before you consider if you should outsource your company's IT to completely new company, wouldn't it be nice to have a chance to meet their employees, evaluate the quality of their technical work and do it all without the pressure of a sales call? Well now you can do just that and you can do it for free during this month! This month ANP is offering a free Network Assessment; it will require three ANP employees and apoximately 15 hours of work; ANP values that work at $2,500! It will require only one hour of your time! If you have over 30 PCs and a Server, ANP will provide the assessment for free! We schedule a 1 hour meeting with you and our engineer. Our engineer will work remotely from ANP's office. We will use a WebEx session from your office, and you will personally enter all of your passwords (The ANP engineer will not see your passwords nor ask you for any of them.) You can be assured that you network will remain secure after the Assessment. You will be able to watch everything that our engineer looks at and evaluates, because it will display on your own PC screen during the WebEx meeting. The engineer will ask you questions about your email, data backups and your line of business applications. You will not need to posess any technical IT knowledge. The data that is acquired during the assessment will be reviewed by a senior ANP Level III engineer and then sent to our Client CIO. Our Client CIO will evaluate all aspects of the data and prepare a written Network Assessment 10 page report. Your assessment data will be compared to IT Best Practices for Small and Medium sized businesses. The written Network Assessment report will have each technology rated as: "meets best practices, "partially meets best practices," or "does not meet best practices." The best practice will be described in detail. A written observation of your IT infrastructure will be described. An explanation of how you should remediate your issue(s) is also included. The report will be delivered to you and your team in your office with our Client CIO and Account Manager. You will receive a written copy of the report after the meeting is completed. Every Business Owner who has Received our Network Assessment has been Thrilled with our Deliverable & Easy Process! You Will Too. 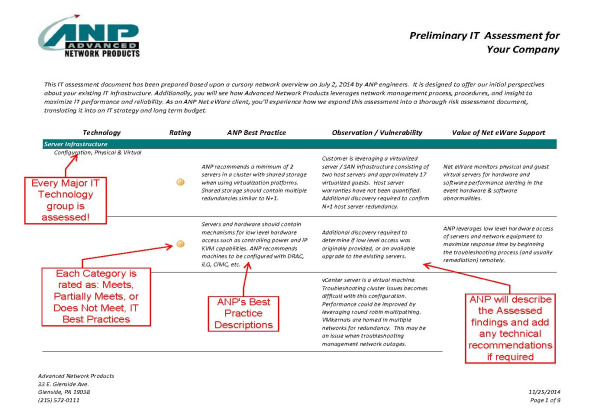 Sign Up Now..
Click HERE to see a sample ANP Assessment report. Sign up now to schedule your free, no-risk IT Network Assessment. Your information will not be shared with any third parties. If your company is smaller than 30 PCs, ANP will perform your audit for a small fee. ANP has made a limited number of free assessments available this month; register for yours before they are all reserved!